Featuring Iwata’s Smart Technology, the Smart Jet compressor is perfect for the occasional and professional artist doing general airbrush applications. It’s powerful, compact, reliable and quiet. The compressor automatically shuts itself when it is not in use, which means less heat-related moisture build-up, less motor wear and longer compressor life, and inherently quieter operation. 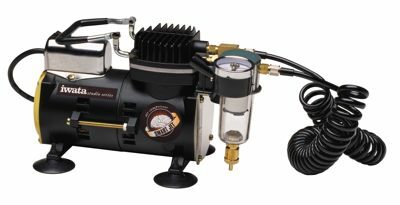 This zero-maintenance, oil-less piston air compressor includes a built-in airbrush holder and an extra hose for enhanced moisture separation.